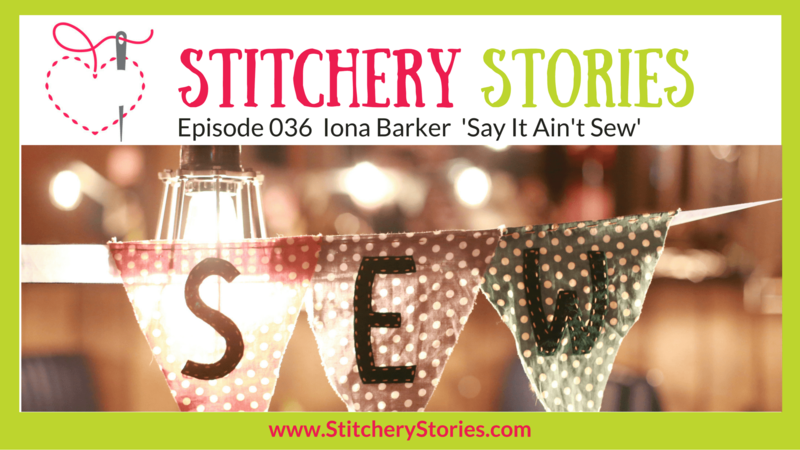 Iona Barker is our guest today on the Stitchery Stories textile art podcast. Iona shares her story of creativity and then burnout as she pursued her fashion and costume career. 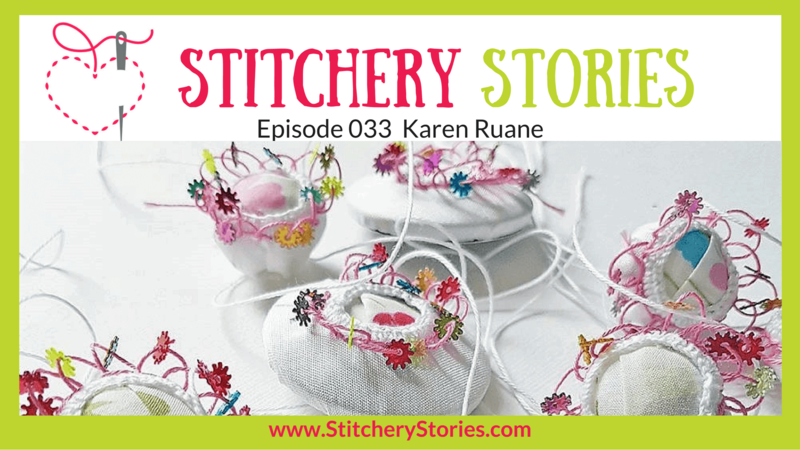 Karen Ruane is our guest today on the Stitchery Stories embroidery podcast. Karen shares her life as a contemporary hand embroidery artist who specialises in teaching and building supportive communities via online embroidery courses. 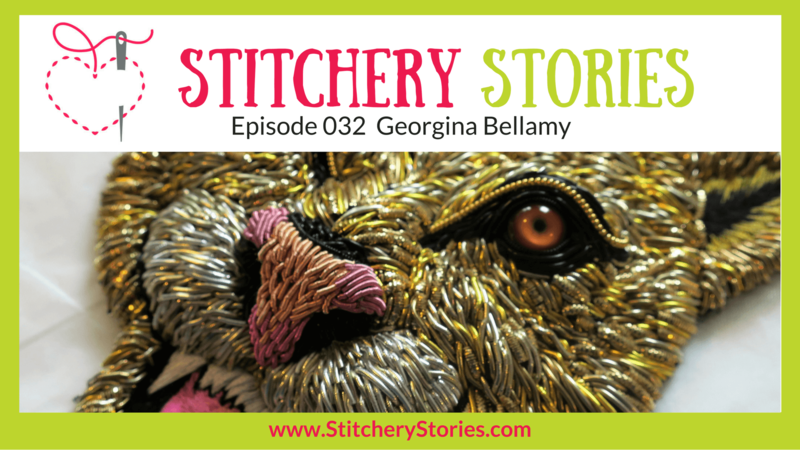 Today on the Stitchery Stories embroidery podcast, Georgina Bellamy shares her life as a hand embroidery artist who specialises in creating truly gorgeous 3D goldwork and beaded animals. Listen as Georgina shares her embroidery journey from working at a Dry Cleaners, through City & Guilds, a degree and then stepping out on her own and developing her embroidery brand and business. She shares stories that highlight the battle between creativity and commercial necessity and the challenges of teaching workshops around Europe. We also chat about being brave and being engaging on social media, particularly using live streaming and videos. 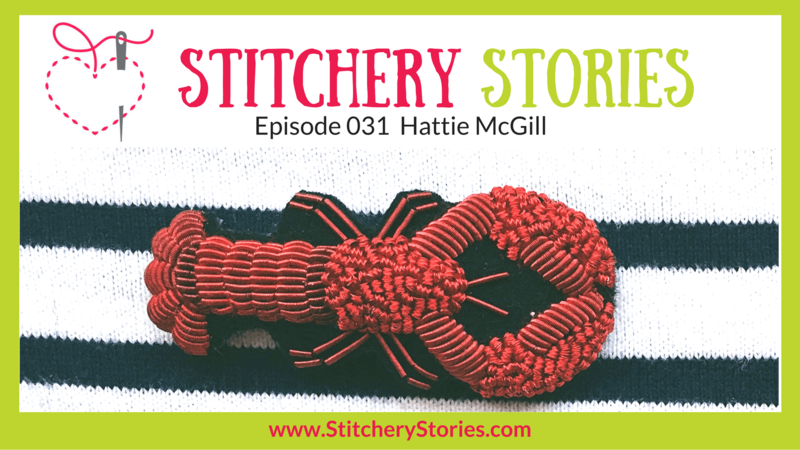 Today on the Stitchery Stories embroidery podcast, Hattie McGill shares her life as a hand embroidery artist and freelance embroiderer working in fashion, costume and film. Listen as Hattie shares her embroidery journey and how she balances her own art for sale and commission, with the typically unpredictable world of being a freelance embroiderer. Hattie also shares some very interesting insights into doing embroidery for films and fashion designers. And by total contrast, her own work is heavily influenced by the natural world and objects around us. 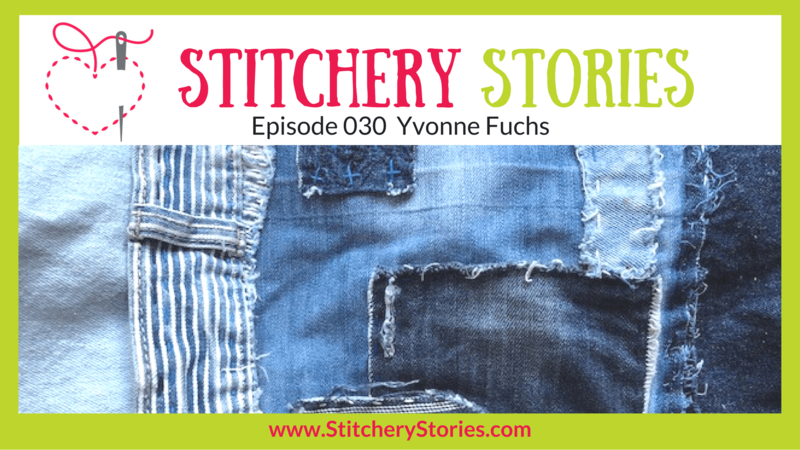 Today on the Stitchery Stories textile art podcast, Yvonne Fuchs shares her relaxing approach to slow stitch and creating mindful and contemplative textile art. Listen as Yvonne shares her textile journey and her world journeys and their influence on her work. 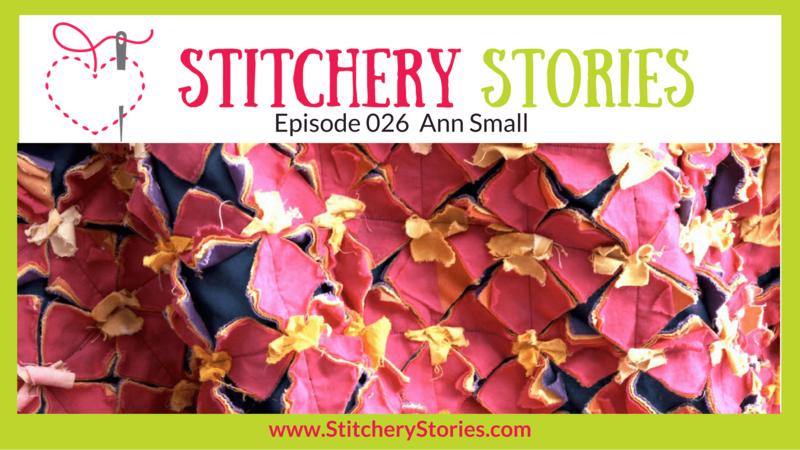 We are focusing on Slow Stitch today. Yvonne has combined her 2 worlds of Zen and mindfulness with her love of teaching textile art to create unique classes in Slow Stitch. Yvonne explains the backstory that led to the creation of this approach and the many benefits that combat our stressful and busy lives, including creating beautiful and very personal pieces of work. 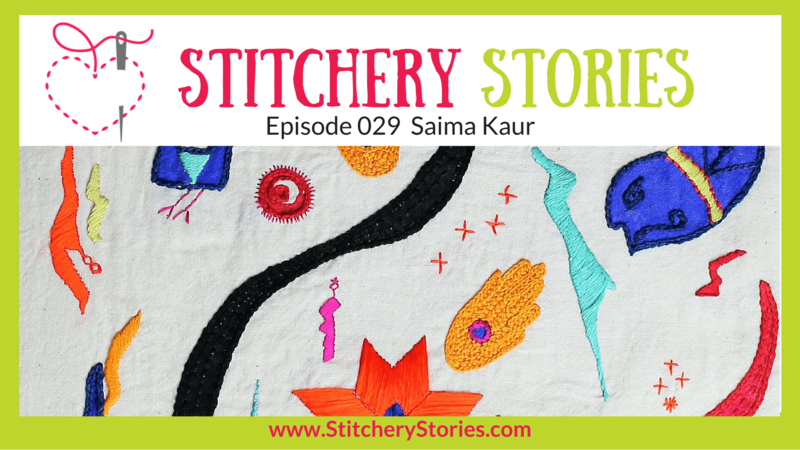 Today on the Stitchery Stories textile art podcast, Saima Kaur shares her colourful hand embroidery inspired by her Indian heritage and Indian Folk art. Listen as Saima shares her embroidery journey and begins her adventure into creating a sustainable business through her textile art. Saima has an interesting story and brings Indian textiles alive through her own textile collection and research. 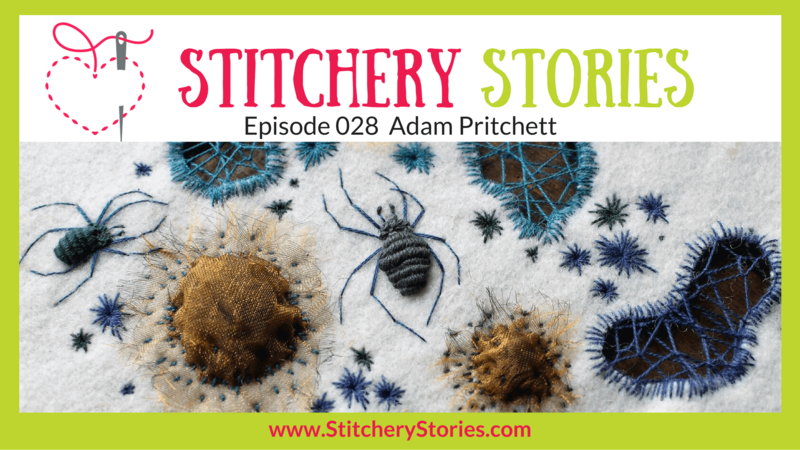 Today on the Stitchery Stories textile art podcast, embroidery artist Adam Pritchett shares his intricate embroidered spiders and pieces inspired by antique frames, antiquarian themes… and a sprinkling of magic and creepiness! Listen as Adam shares his relatively recent embroidery journey through his inspirations and techniques. And of course, he gets a Gold Star for being our first male embroidery artist on Stitchery Stories. 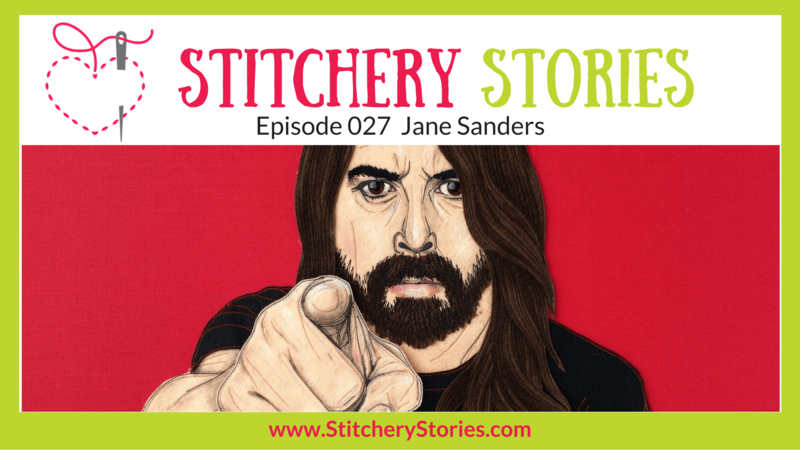 Today on the Stitchery Stories textile art podcast, Jane Sanders shares her vibrant and exciting textile portraits of very iconic pop stars. The stars Jane chooses for her portraits are famous across a range of genres, eras and styles, so there is always something fresh about her work. 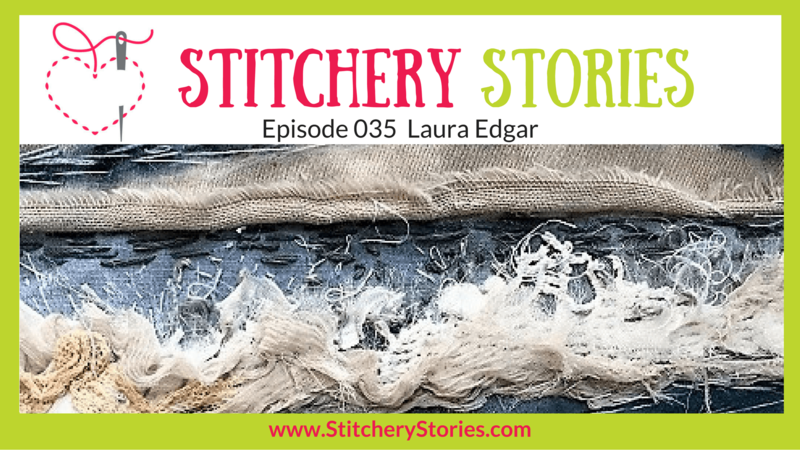 And even if you don’t like all of their music – you will love the artistry and stitching that Jane creates… in her kitchen! Listen as Jane shares her inspirations, techniques, and how everything always comes in useful eventually. Ann does indeed have 2 very different aspects to her work and creativity. There are her colourful reverse applique based, large hangings which she describes as her serious textile art work. Then there are her very individual character dolls which she makes to look very old. These are her ‘fun’ outlets for her creativity.